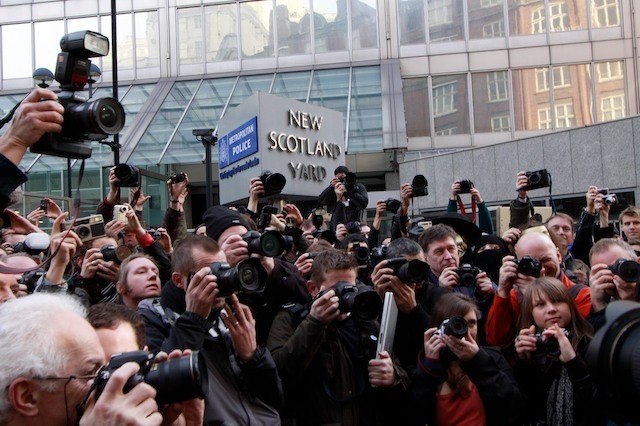 Following what it euphemistically describes as "ongoing debate" over the right to take photographs of the police - a debate that saw hundreds campaign earlier in the year - the Met today issued a document offering photography advice to the concerned citizen. The full text of the document can be read here, but at first read it seems to try and clarify the controversial Section 76 of the Counter Terrorism Act 2008, which came into being this year, in which the police awarded themselves the power to hassle and even arrest any snapper who dares train his or her lens on a member of the Force going about some dubious business. It's worth reminding ourselves that, since then, there's been at least one major incident in which citizen journalists were vital in recording, how should we put it, "questionable" police behaviour. The Met's advice starts off well, declaring unequivocally that members of the public and the media do not require a permit to film or photograph in a public place, and that the police cannot stop them doing so, nor can they stop them from photographing incidents or the police themselves. It also states that any officer making an arrest under Section 76 must "be able to demonstrate a reasonable suspicion that the information was of a kind likely to be useful to a person committing or preparing an act of terrorism". Strong stuff. However, things get a little darker with the warning that "there is nothing preventing officers asking questions of an individual" taking photos of an officer. Of course, presumably any such interrogation questioning would proceed along the friendliest of Stasi-style lines of inquiry. Furthermore, officers have the right to view any photographs taken in an area under the authority of Section 44 of the 2000 Terrorism Act; it's worth mentioning that all of London counts as such an area. Perhaps it's time to think about a move back to 35mm film. The document does recognise that use of amendment should "ordinarily be considered appropriate", yet photographer Mark Vallee cites two occasions on which it was invoked by officers. In neither case did the police officers involved seem fully aware of the law's remit. And that's what is so troubling about this situation, woolly-headed advice be damned. By couching it all in such vague terms, the issue of interpretation is left to officers on the field wh, some of whom have become accustomed to treating photographers as irritants or troublemakers. Incredibly, there's still some confusion over whether these new rules are worth the pixels they're printed on: apparently the Home Office wasn't consulted, and one lawyer has already said that the advice doesn't take into account protected journalistic material. Rather than illuminating a flashgun onto the subject, the Met has left us all with another underexposed image.